As smartphones become more and more indispensable in our daily lives, automotive manufacturers are slowly looking for ways to integrate them into their vehicles to make them more appealing for today’s always-connected users. We’re seeing it already with Chevrolet and its efforts in integrating Siri into its latest cars, and now, Hyundai is showcasing its version of a Connected Car. The Korean manufacturers are calling it the Connectivity Concept car,where the company demoed the system with an i30 compact hatchback at its European HQ in Frankfurt, Germany. The car substitutes the standard car keys with an embedded NFC chip, where a simple tap or swipe with the driver’s smartphone will unlock the doors. Also, the NFC chip is capable of identifying different NFC tags between different drivers’ smartphones. This makes it theoretically possible for the car to save presets of, say, a driver’s seat and side mirror positions and trigger them whenever a driver taps his or her smartphone to the car. Upon entering the car, the driver needs to place his or her phone onto the centre console, which has a Qi-standard wireless charging plate to wirelessly charge the phone. Only upon placing the phone there can the driver start the engine. Also, the Connectivity Concept car will also be using the industry-standard MirrorLink to automatically sync the driver’s smartphone’s contacts, maps & navigation, music as well as apps to the 7-inch touchscreen on the dashboard. 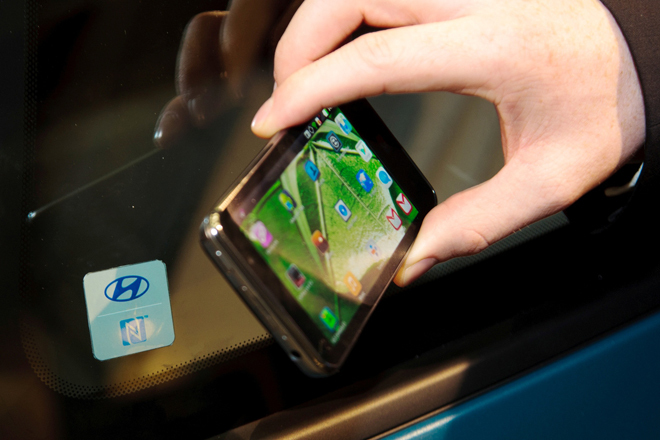 Hyundai is aiming for to include the system in its range of products by 2015. While all these are really cool features to have in cars of the future, it will be just as interesting to see the security measures that will be used to prevent car theft, especially when losing a smartphone in the near future could also mean losing a car.